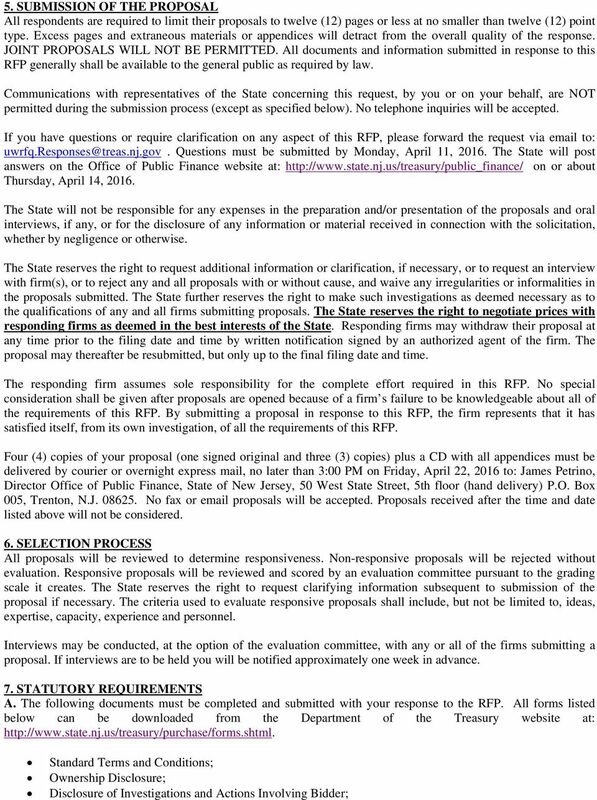 Download "REQUEST FOR PROPOSALS FOR FINANCIAL ADVISORY SERVICES"
2 REQUEST FOR PROPOSALS FOR FINANCIAL ADVISORY SERVICES NEW JERSEY BUILDING AUTHORITY CAPITAL BUDGET MODELING AND ADVISORY SERVICES STATE FISCAL YEARS 2016, 2017 AND PURPOSE AND INTENT The Treasurer of the State of New Jersey (the State ) is soliciting proposals on behalf of the New Jersey Building Authority ( NJBA ) from qualified firms interested in serving in the role of financial advisor to provide advice and assistance to the State and the NJBA in connection with Capital Budget Modeling and Advisory Services (the Financial Advisor ). Capital Budget Modeling and Advisory Services A capital budget is a financial plan for the finance, acquisition, construction, reconstruction, rehabilitation, repair, improvement and operation of long-term capital infrastructure investments for projects eligible for NJBA bond financing. The capital budgeting process for the State and the NJBA requires careful longterm planning. The State and the NJBA plan on relying on a Financial Advisor to provide certain capital budget modeling and advisory services. The State and the NJBA are looking for a Financial Advisor to calculate for each proposed investment the Payback Number, the Unadjusted Rate of Return, the Internal Rate of Return, and the Net Present Value. The Financial Advisor is expected, as part of the Scope of Services, to model all supporting financial statements and related schedules to support the Financial Advisor s calculations. 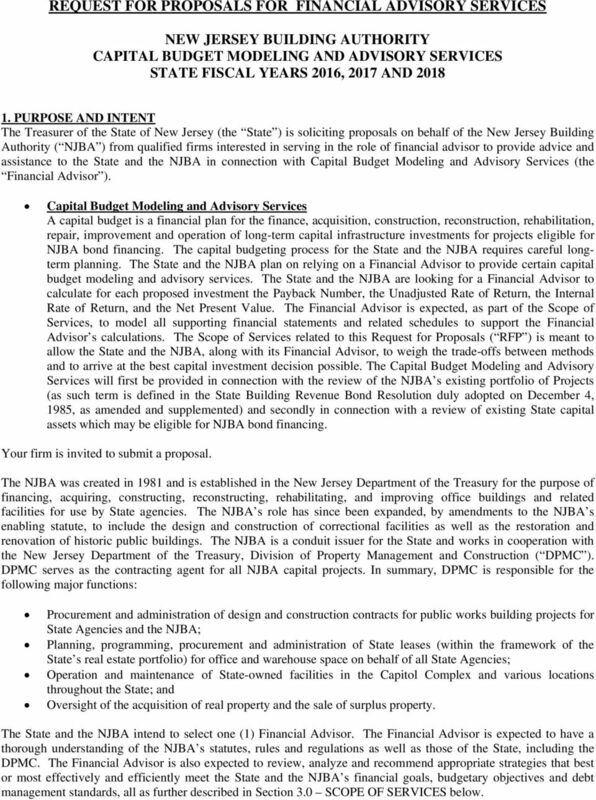 The Scope of Services related to this Request for Proposals ( RFP ) is meant to allow the State and the NJBA, along with its Financial Advisor, to weigh the trade-offs between methods and to arrive at the best capital investment decision possible. 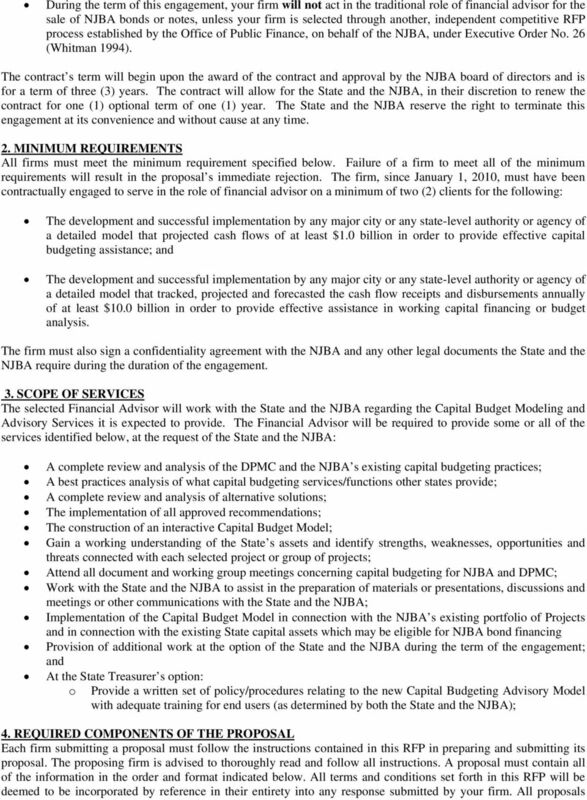 The Capital Budget Modeling and Advisory Services will first be provided in connection with the review of the NJBA s existing portfolio of Projects (as such term is defined in the State Building Revenue Bond Resolution duly adopted on December 4, 1985, as amended and supplemented) and secondly in connection with a review of existing State capital assets which may be eligible for NJBA bond financing. Your firm is invited to submit a proposal. The NJBA was created in 1981 and is established in the New Jersey Department of the Treasury for the purpose of financing, acquiring, constructing, reconstructing, rehabilitating, and improving office buildings and related facilities for use by State agencies. The NJBA s role has since been expanded, by amendments to the NJBA s enabling statute, to include the design and construction of correctional facilities as well as the restoration and renovation of historic public buildings. The NJBA is a conduit issuer for the State and works in cooperation with the New Jersey Department of the Treasury, Division of Property Management and Construction ( DPMC ). DPMC serves as the contracting agent for all NJBA capital projects. In summary, DPMC is responsible for the following major functions: Procurement and administration of design and construction contracts for public works building projects for State Agencies and the NJBA; Planning, programming, procurement and administration of State leases (within the framework of the State s real estate portfolio) for office and warehouse space on behalf of all State Agencies; Operation and maintenance of State-owned facilities in the Capitol Complex and various locations throughout the State; and Oversight of the acquisition of real property and the sale of surplus property. The State and the NJBA intend to select one (1) Financial Advisor. The Financial Advisor is expected to have a thorough understanding of the NJBA s statutes, rules and regulations as well as those of the State, including the DPMC. The Financial Advisor is also expected to review, analyze and recommend appropriate strategies that best or most effectively and efficiently meet the State and the NJBA s financial goals, budgetary objectives and debt management standards, all as further described in Section 3.0 SCOPE OF SERVICES below. 4 received, and any information contained therein, are subject to disclosure in accordance with the New Jersey Open Public Records Act. Interested firms must respond to all of the questions listed below: In your proposal please respond to each question by repeating the question at the top of the section and referring to the question by the numbers used in this RFP. 4.1 Provide a one page Executive Summary identifying and substantiating the basis of your contention that you are the best qualified firm to provide the requested financial advisory services to the State and the NJBA. In your one page Executive Summary, please provide the name, title, business address, address, telephone number and fax number of the individual the State and the NJBA should contact regarding your proposal. 4.2 Provide a brief description of your firm, its ownership structure and its state/country of incorporation or formation. Describe your firm s physical presence in the State of New Jersey, including the number of offices, the number of employees and the type of business activity conducted in the State. Also, please describe the participation of women and minorities in your firm. Please indicate the percentage of your firm that is owned by women and minorities. 4.3 Please list the completed assignments that show that your firm has satisfied Section 2.0 MINIMUM REQUIREMENTS stated above. Please provide references for each engagement. 4.4 Provide two (2) specific examples of successful capital budgeting, cash flow modeling or budget analysis your firm has provided for governmental entities in need of borrowing for either capital or working capital. Provide a description of the problems the governmental entities faced, total revenue and disbursements projected, and the size of the project or funding gap. Please provide references for each example. Also please explain how these examples best illustrate your firm s ability to achieve the proposed goals of the Authority under this RFP. 4.5 Provide a staffing plan listing those persons who will be assigned to this engagement. Identify the person who would have the primary responsibility for the engagement, as well as the person assigned to the project that has education or experience with capital budgeting standards. Include for each person the relevant resume information including, at a minimum, a description of the person s relevant professional experience, and type of experience and number of years with the firm. Also, for each individual, identify what role, if any, the individual will perform in connection with the assignment described in Section 3.0 SCOPE OF SERVICES, above. 4.6 List the blended hourly rate which you would to expect to charge for any individual who would be responsible for providing assistance. 4.7 Please provide any additional information you consider relevant to the selection process, such as prior advisory experience with the issuer or the State; other recent transaction of this nature; or anticipated extraordinary expenses. 4.8 Provide as an appendix, all appropriate financial models, schedules or projections that supports Section Identify any existing or potential conflict of interest, or any relationships that might be considered a conflict of interest, that may affect or involve transactions of the State Describe any pending, concluded or threatened litigation, administrative proceedings or federal or state investigations or audits, subpoenas or other information requests of or involving your firm or the owners, principals or employees thereof during the period beginning January 1, 2010 to the present. Describe the nature and status of the matter and the resolution, if any List any sanctions or penalties brought against your firm or any of its personnel (including suspension or disbarment) by any regulatory or licensing agencies. Include a description of the reasons for the sanction or penalties and whether such sanctions or penalties are subject to appeal Provide as an appendix, the last two G37 reports your firm has filed and if applicable, form G38t. 6 MacBride Principles; Affirmative Action Employee Information Report; Set Off for State Tax; Source Disclosure Certification Form; New Jersey Business Registration; Disclosure of Investment Activities in Iran; Contract on Certification and Disclosure of Political Contributions (N.J.S.A. 19:44A et seq. ); and Vendor Certification (P.L. 2005, c. 271). NOTE: A copy of a valid New Jersey business registration must be submitted. If not already registered with the New Jersey Division of Revenue, registration can be complete on-line at the Division of Revenue website: B. Specific Statutory Requirements 1. Chapter 51 and Executive Order No Pursuant to Public Law 2005, Chapter 51 ( Chapter 51 ) and Executive Order No. 117 (Corzine 2008) ( Executive Order 117 ), State departments, agencies and authorities are precluded from awarding contracts exceeding $17,500 to vendors who make certain political contributions on and after October 15, 2004, to avoid any appearance that the selection of contracts is based on the contractors political contributions. Chapter 51 also requires the disclosure of all contributions to any political organization organized under 26 U.S.C. 527 that also meets the definition of a Continuing political committee within the meaning of N.J.S.A. 19:44A-3(n) and N.J.A.C. 19: Failure to submit the certification and disclosure form(s) shall be cause for rejection of your firm s proposal. 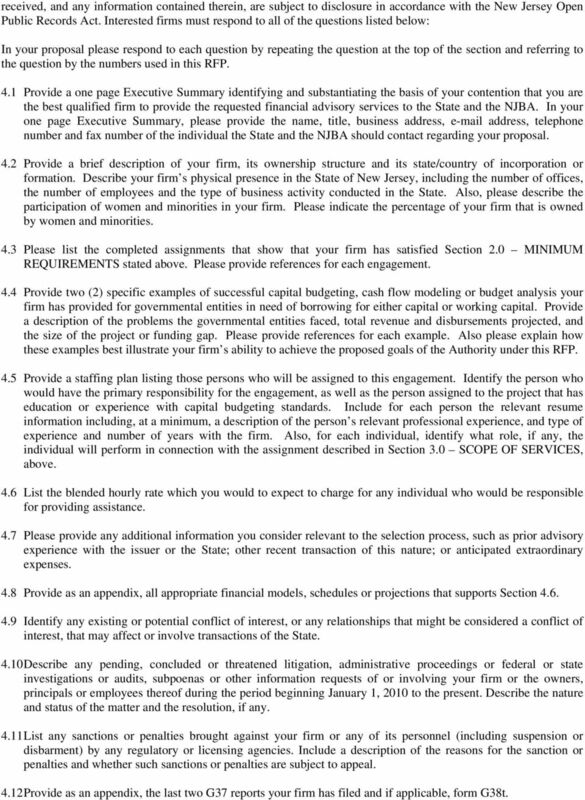 To obtain the necessary forms and information on how to comply with Chapter 51 and EO 117, prospective bidders should access: The firm or firms selected pursuant to this RFP shall be required to maintain compliance with Chapter 51 and Executive Order 117 during the term of its or their engagement. 2. Chapter 271. Pursuant to Public Law 2005, Chapter 271 ( Chapter 271 ), your firm is required to disclose its (and its principals ) political contributions within the immediately preceding twelve (12) month period prior to entering into a contract. No prospective firm will be precluded from entering a contract with the State by virtue of the information provided in the Chapter 271 disclosure provided the form is fully and accurately completed. Prior to award of this engagement, the firm selected pursuant to this RFP shall be required to submit Chapter 271 disclosures. Please refer to for a copy of the Chapter 271 disclosure form. It is not required to be completed in connection with the submission of your proposal. 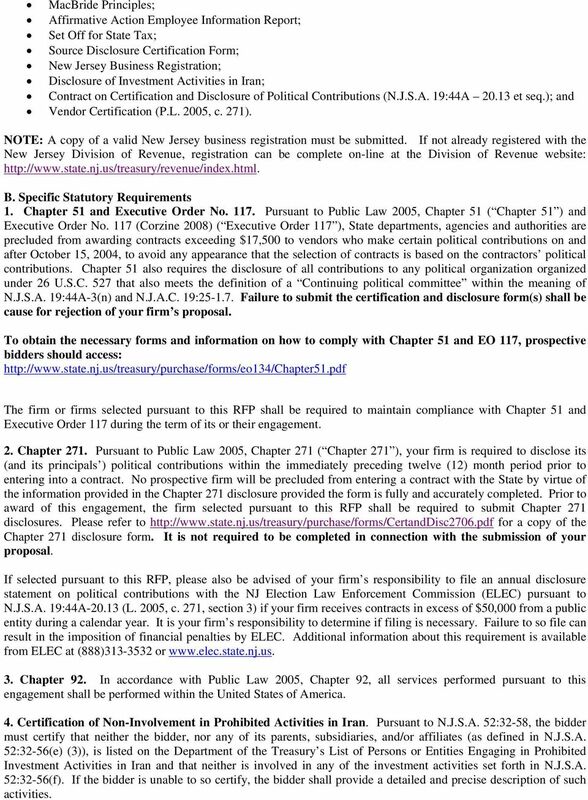 If selected pursuant to this RFP, please also be advised of your firm s responsibility to file an annual disclosure statement on political contributions with the NJ Election Law Enforcement Commission (ELEC) pursuant to N.J.S.A. 19:44A (L. 2005, c. 271, section 3) if your firm receives contracts in excess of $50,000 from a public entity during a calendar year. It is your firm s responsibility to determine if filing is necessary. Failure to so file can result in the imposition of financial penalties by ELEC. Additional information about this requirement is available from ELEC at (888) or 3. Chapter 92. In accordance with Public Law 2005, Chapter 92, all services performed pursuant to this engagement shall be performed within the United States of America. 4. Certification of Non-Involvement in Prohibited Activities in Iran. Pursuant to N.J.S.A. 52:32-58, the bidder must certify that neither the bidder, nor any of its parents, subsidiaries, and/or affiliates (as defined in N.J.S.A. 52:32-56(e) (3)), is listed on the Department of the Treasury s List of Persons or Entities Engaging in Prohibited Investment Activities in Iran and that neither is involved in any of the investment activities set forth in N.J.S.A. 52:32-56(f). If the bidder is unable to so certify, the bidder shall provide a detailed and precise description of such activities. NEW JERSEY EDUCATIONAL FACILITIES AUTHORITY REQUEST FOR PROPOSALS FOR SERVICES AS AN INDEPENDENT REGISTERED MUNICIPAL ADVISOR. CHAPTER 5 Registration of Broker Dealers, Investment Advisers, and Agents INTRODUCTION In this section we will examine the state registration process for broker dealers, investment advisers, and agents. STATE OF WISCONSIN. Relating to VARIOUS PROGRAMS AND OBLIGATIONS ELECTRONIC SUBMITTALS DUE BY NOON (CT) THURSDAY, JULY 30, 2009.